The advert record count stands at 73,623 and it’s unlikely to grow significantly in the near future as new material becomes increasingly difficult to find. I’m quite pleased with the latest update (October) which filled some gaps for years 1917-1921. 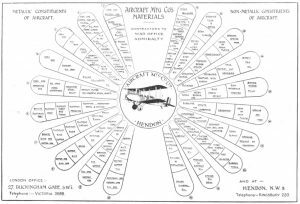 I still have some processing work to do on the Aircraft Engineering Publications which will feature in the next database update. WW1 & the immediate post WW1 period ads tended to be quite formal and visually low key but I did find this 1918 advert from the Aircraft Manufacturing Company particularly interesting. Search: Aircraft Manufacturing Company Adverts 1918 and scroll down the page and look for Ad Ref 73554. (you’ll need the hi-res version to see the detail. This website has been evolving for about 10 years now, and has a lot of links to the database, internal pages as well as a great many images scattered about the place. Unfortunately all the above are referenced by simple http://www. hyperlinks. This works fine, but modern browsers are programmed to treat anything appearing from outside the SSL (secure socket layer) as a threat. So stumping up for a certificate and changing all links to https://www. is now the number one task – I’m on this full time now and expect to have the work complete by the third week of November 2018.